Time for another shoe review!! This time the Adrenaline GTS 14! 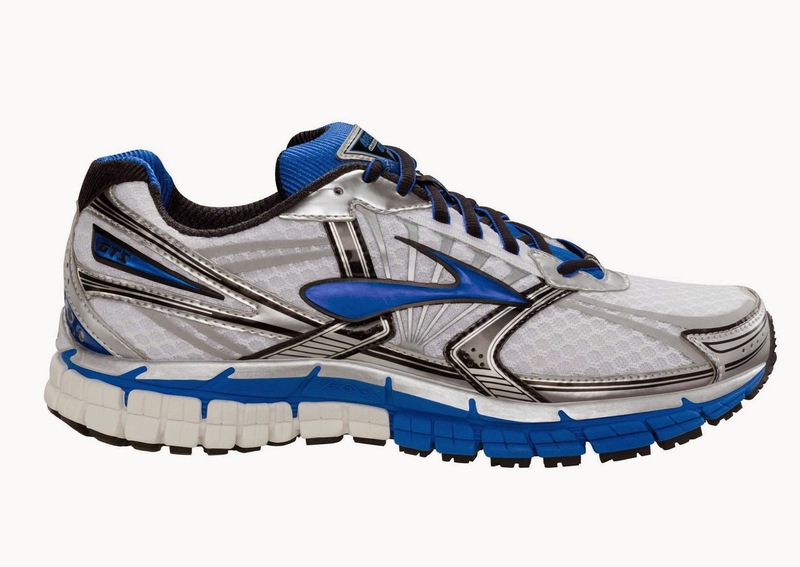 Brooks Running lists the shoe as weighing 11.3 ounces and having a 12mm heel-toe drop. It is considered a support shoe with a thick medial Progressive Diagonal Roll Bar (that grey foam on the medial side. See the second picture. Someday I'll label the pictures as figures). It's a little strange for me to be wearing this shoe. It fits so well, but it's a high stability shoe. Only a 4 months ago I would have laughed at the idea of wearing a shoe with this much stability or that was this traditional. But here I am. And I really like this shoe. First off, the fit is amazing. For a shoe like this, I was not initially expecting that until I tried it on. The toebox fits well and the heel/midfoot holds your foot down nicely. I feel no pressure on my toes wearing this shoe. That can make or break a shoe for me. The length in a 10 is absolutely perfect for me. This shoe fits REALLY well. I am very impressed. That's how it won me over so quick. 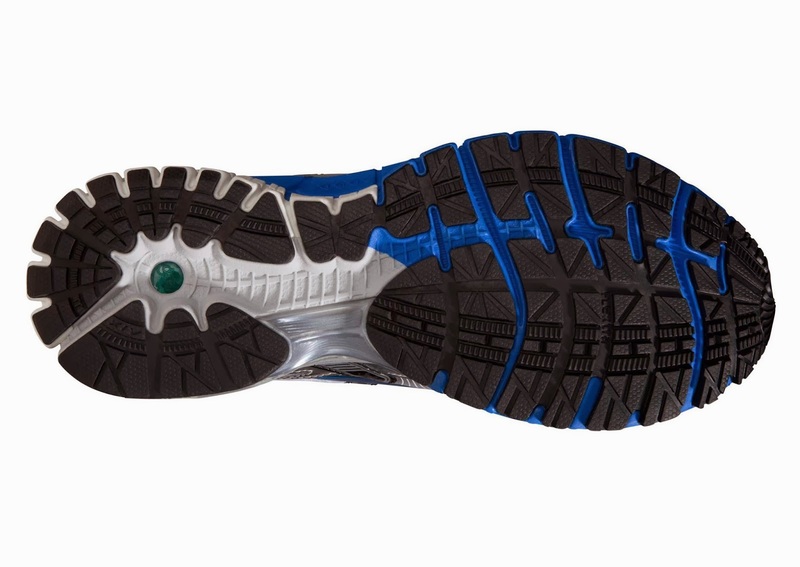 I know previous versions were fairly tight in the forefoot as well as very controlling stability wise. This shoe is different. Anyway, I wanted to keep wearing Brooks (because that's the apparel I own and I like pretending I'm an elite athlete sponsored by them. I am extremely self-conscious and weird. Hence one of my previous posts about wanting to be sponsored. I really shouldn't care, but I do. That post was a giant whine fest) and I knew I needed a support shoe to stop my ankle from moving as much as it does. And it moves A TON! People have watched me run during various gait analysis for undergrad biomechanics projects or research and everyone wonders how I don't break my ankles while running. Yet I trained in minimal and mostly neutral shoes for 3-4 years during college and a little after (Altra, Brooks Pure series, one pair of neutral Newtons, racing flats, Saucony Kinvara, Saucony Cortana which was a little better and so on). Why? Because I was sooooo obsessed with footstrike and was sure it would keep me healthy. Little did I know that it's only a part of the whole equation. Hip kinematics and strength are much more important. I had won a free pair of shoes from Fleet Feet Rancho Cucamonga (every time I say or read "Cucamonga" I can't help but think of Looney Tunes and Bugs Bunny) for winning the Megan Savage Memorial 5k and setting a course record there. So I headed over and tried them on (already having researched them). I established that I was an experienced shoe salesman already, so they let me go about my business. Sure enough, despite being a minimal guy, the shoe fit the second I put it on. Nothing bothered me. The fit was good, the PDRB was not intruding, the 12mm drop didn't bother me and it was responsive!! Not super cushy! I got them and went about my business running and rehabbing myself. Really I should have taken time off from running and just let my injury heal, but I am a full on running addict. If running was a tangible substance, I would take it in suppository form without question. So yeah. This shoe is good. I don't feel like my form is affected because it is responsive and I can feel the full ground contact. I really like that latter aspect because I think it's really important. Shoes that split in the midfoot I think (this opinion is my own. I have no research to back it up except testimonial evidence from myself, various physical therapists and biomechanists. So take it with a grain of salt) can lead to issues. Why? Because the foot doesn't really flex there. It's ok if the full shoe is flexible, but when that is one of the main points of flexibility and the rest of the shoe is stiff, I think that can lead to problems. Again, just testimonial from working in running retail and observing thousands of people run as I fit them and hear their stories. Are there exceptions? Yes. 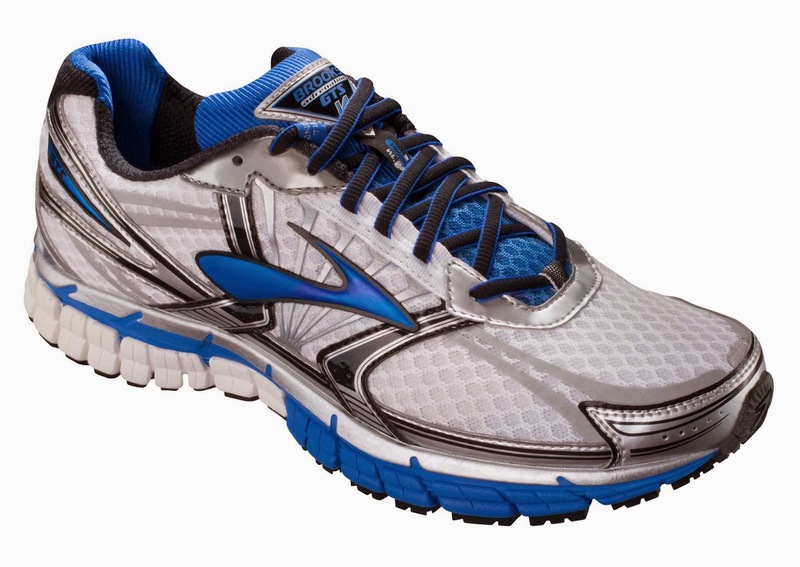 I love the Brooks ST5 racer and it has a separate heel and forefoot. So maybe I'm wrong. Every company either does it or tries to compensate. Nike and Brooks are generally full contact outsoles, Saucony and New Balance do it in most of their shoes, while Asics and Mizuno are mostly split (but only by a little bit). Asics and Mizuno compensate with thick plastic shanks in the midfoot that are supposed to stop midfoot outsole/midsole splitting. See the picture below? I like that ground contact. And for a stability shoe? It's responsive. I've done most of my Fartleks in this shoe. Because it's not squishy. It's protective but also wants you to run a little fast. I like that. I'm not really a fan of marshmallow shoes. But they have a time and place. The Brooks Ghost is a shoe I use on runs where my body is really beat up and my form goes to sh*t because it's so soft. That and it's a little lighter. 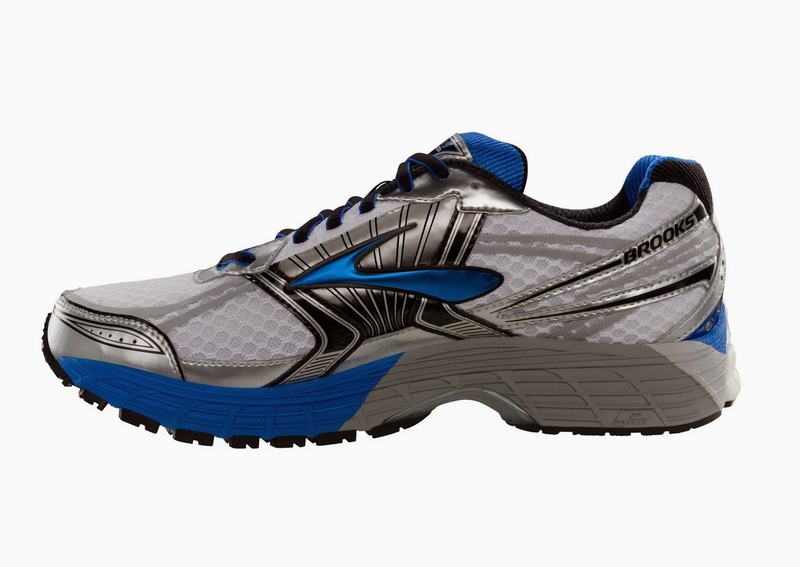 But for the most part the Brooks Adrenaline's 11.3 ounce weight doesn't bother me. In fact I feel fast when I step down to lighter weight shoes for races and workouts. It's kinda nice. And the stability aspect. It feels like customized support. The PDRB doesn't get in my way if I don't need support. I don't feel it when picking up the pace, but when I get tired I feel it supporting me. It's not the the controlling, grip your ankle and prevent all movement type of support. It's the supportive, good friend type of support. There when you need it and doesn't bug you when you want to be neutral. So those of you coming from previous versions, it's going to feel like there is less support. I know the previous versions because I've tried them and sold a large number of them. This shoe is one of the (if not the most) popular shoes in running retail. I can't tell you how many Adrenalines I've sold over the years. And the shoe continues it's legacy of being really good. Heck, it even won over me, the minimalist runner (or ex minimalist now). This is one of the shoes that converted me back to traditional shoes. I haven't had any problems with it. My achilles and peroneal are fine (could also be the dedicated rehab program. Confounding variables right there...), I can still run in the 6:30s on easy days in this shoe (although I shouldn't so I can recover), and I've done fast workouts in this shoe. Hills and quick Fartleks. Never thought I'd be doing that in a stability shoe. But I am and I've been converted back to traditional shoes. Do I think the Brooks Adrenaline GTS 14 is the shoe for everyone? No. Human variability is very real. Do I think the minimal movement should die? No. It needs to influence how we think about shoes. IE having them work with your body instead of forcing it to do things as much as shoes have done in the past. So the PDRB and the customized support is awesome. Finally, durability. It's pretty good. Coming from minimal shoes that lasted 200-250 miles, this is so much better. I generally stop at 400-500 miles just in case because my feet are a bit sensitive, but it's easily a shoe you could get more out of. The outsole gets dirty, but stays fairly intact. I'm breaking in my third pair of GTS 14s right now and my previous pair have 487 miles on them. Are they done? No, but I want to be careful because I started to get that "dead shoe" feeling. So they'll be regulated to walking and casual duties. Also the "Random Running" duties that I do. And by that I mean the half mile runs I do during our 10 minute breaks in school. So yeah. If you have stability needs, check out this shoe. As always I suggest trying shoes on before you buy them. Head down to your local running retail store. Every store is going to be carrying this shoe. Why? Like I said, it's one of the most popular shoes in run specialty. It has been made even better with a wide toebox and awesome fit. There are widths available, so if you have excessively narrow or wide feet, the Adrenaline 14 also comes in B, 2E and 4E. I use the lace locking technique on all my shoes and it makes this shoe even better. The fit is pretty adaptable. I really can't say enough good things about this shoe. At least give it a look if it suits your biomechanics. This shoe was a personal purchase (purchases, plural, since I'm on my third pair) and as always, my thoughts are my own. *Images were obtained from the Brooks Running website. Go check out the shoe. My short review is up there in the review section as "kleinruns"